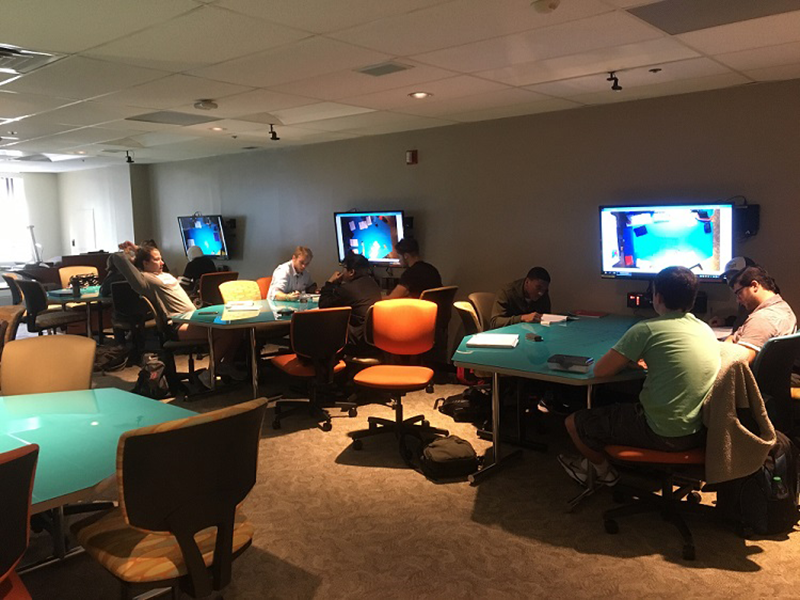 A new innovation has been incorporated into one of the University’s FlexTech classrooms thanks to the creativity of Computer Science Professor Dr. Patrick Juola from the McAnulty College and Graduate School of Liberal Arts. 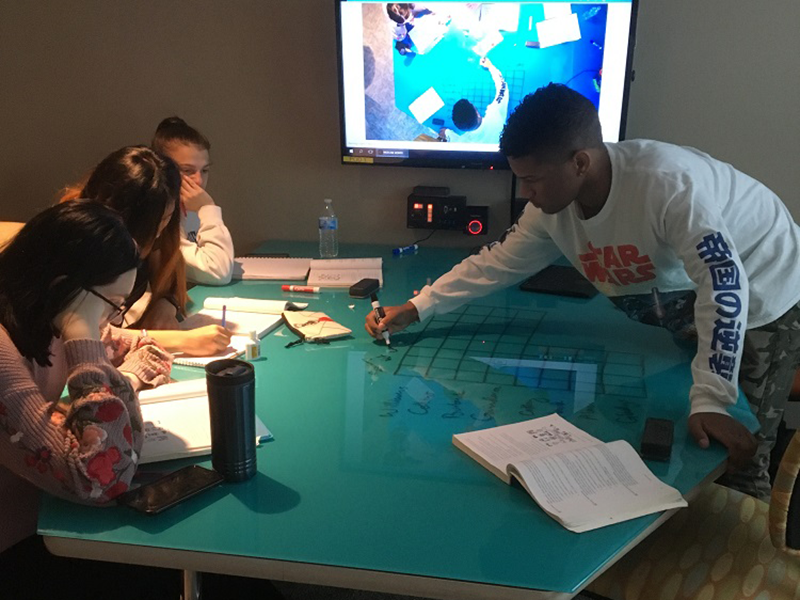 For his Teaching Problem Solving with Creative Mathematics course—taught in the FlexTech Classroom in Room 442 Fisher Hall—Juola wanted to take the use of the writeable glass tabletops to a new level. Taken by many students who are creative and visual learners, the class fulfills the mathematics requirement for the University Core Curriculum. “The ability to sketch a visual representation helps to enhance the understanding of a problem,” Juola explained. 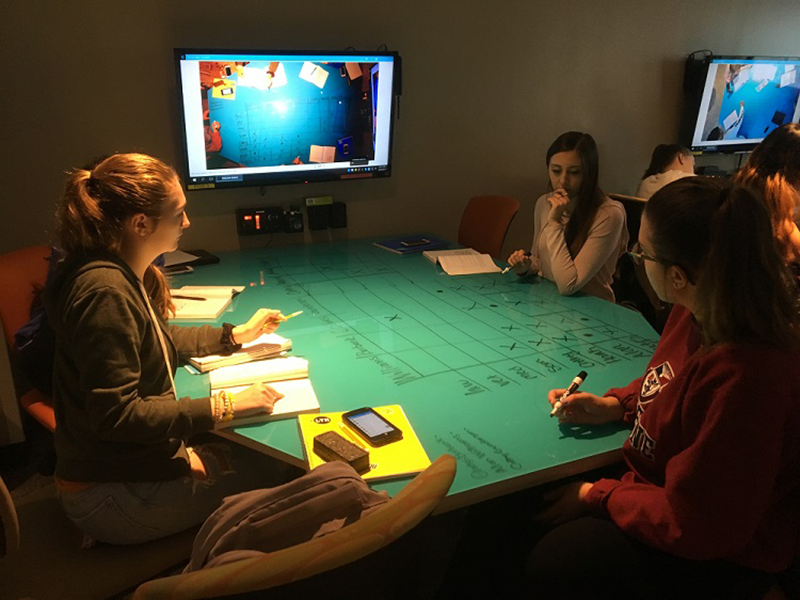 Wanting to share the sketches and student solutions throughout the class, Juola approached the Office of Classroom Technologies (OCT) about incorporating the ability to display the table drawings onto the projection screens throughout the room. The OCT mounted webcams in the ceiling over each of the seven student tables (or pods) and connected them into the room’s technology. Students can open the webcam software on each of the pod computers and, with the use of Barco’s ClickShare wireless presentation system (which is standard in all the FlexTech classrooms), each group’s work can be easily shared to all screens within the classroom. “The webcams add the ability for students to share diagrams or hand-written notes or things they can’t easily make on a computer,” Juola said. In addition to seeing how other groups have diagramed a problem or solved a puzzle, students love writing on the tables, according to Juola. In a class where diagraming and sketches play a major role, writing on the tables adds a novelty that makes the class unique. Although still a pilot project, Juola said he is happy with the digital and visual sharing of class assignments. “It provides a collaborative, fun environment to work on problems that never the less teach important principles,” he said.